Youngblood International, Inc. is a San Diego based integrative medical facility offering whole health care from the inside out. They are a new practice needing establish a presence on the web and encourage visitors to connect with ease. 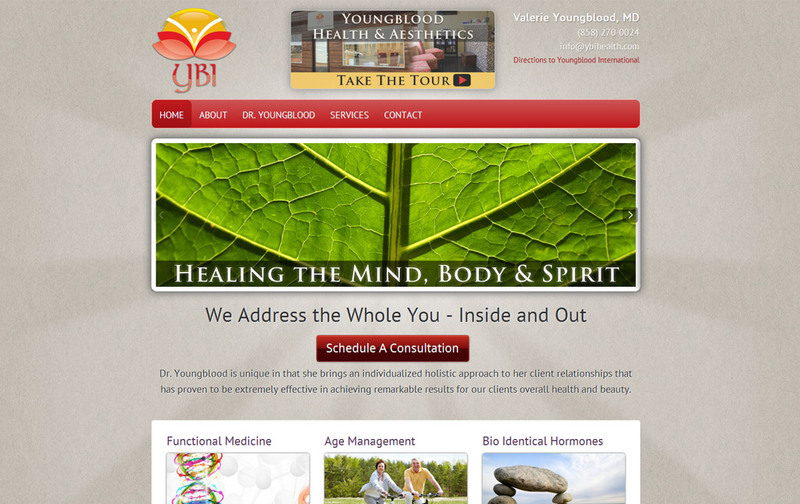 We designed the website, using the logo file provided as inspiration, to focus on the three different wellness areas YBI Health treats – Health, Body, Skin. The content structure for the site was created so that visitors could easily determine the types of services offered and how YBI might be able to best help them. In addition to a website, YBI also needed to set up email and create social profiles. We set up their email for them through Google Apps, and also created branded identities for them on Facebook, Twitter, Yelp, Google+ and Google Places. Visitors to the site have access to a blog containing content and media added by YBI. The site includes a WordPress-based content management system, giving users the ability to easily edit and update in-house.